In the spirit of Record Store Day 2011, here's a personalised brown bag I was given many years ago by a guy who ran and I think still runs a tiny record store in Haverfordwest (West Wales). I religiously visited the tiny indoor market stall that is 'Terminal Records' every school lunchtime searching for new records on sale or making a mental note as to what had been sold since my last visit, I was a proper little geek. There was the occasional sighting of Lemmy from Motorhead in the market but I never saw him. I kept this bag in my scrap book (told you I was a geek) mainly because I think it was probably the only time I had been handed something that had been hand drawn by someone else and also it summed up how I felt in the tiny market stall, well maybe more of 'a haven of tranquillity from the mundaneness of school' back then! Now record stores are my 'haven of tranquillity from work and some of the responsibilities (and people you have to deal with) that comes with being an adult'. They're a place I can go and submerse myself in music, somewhere I can hear new songs and be around people who really appreciate music for music's sake. I can't think of any other type of shop where I get this same feeling. I hope you get the chance to celebrate Record Store Day 2011 by visiting your local record store tomorrow, here's a link to more info. 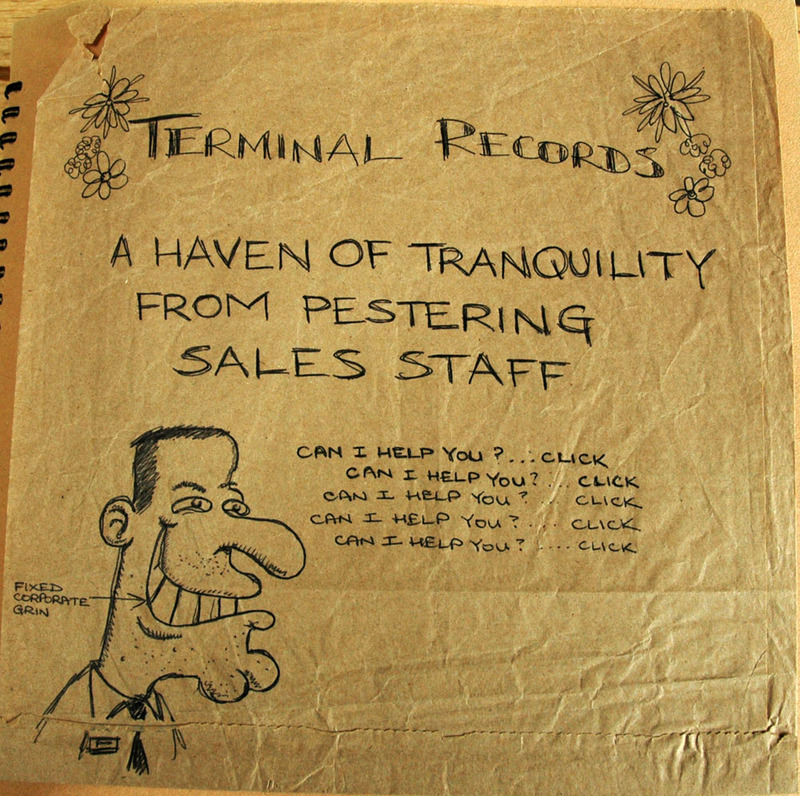 Thank you for putting the vintage Terminal Records, Haverfordwest paper bag online. 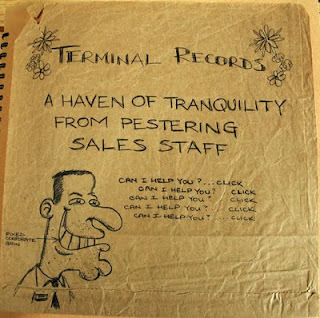 To see hundreds more please see the Terminal Records Haverfordwest Facebook site. There are plans to turn the Riverside Market into a library so Terminal Records may soon be a thing of the past.